I think I’ve started something revolutionary for our meals, grocery shopping, and budget. I never thought this idea would work for me, because 1) I like grocery shopping, 2) We don’t like to waste food, and 3) We follow a strict grocery budget. I didn’t even really plan for it as much as it just kind of happened.This revolutionary concept came about when I got home from visiting my parents over Christmas break, when I vented and asked endless questions about food, cooking, and meal planning. In the past, I’ve been more of a “meal planning” type of person. I would look up 2-4 recipes, write down the ingredients, add in a minimal number of staples if we needed them (milk, cereal, butter, gf crackers, peanut butter, fruit), and buy at least a few unnecessary items while at the store. The following days or week(s), we would end up with a TON of leftovers from the giant meals I had made, which we would eat for lunches (me) and dinners (me and Whit). I would inevitably get sick of the leftovers after a few days (or sometimes after one reheated meal), and Whit would be stuck finishing the rest. We would also usually end up with a stack of veggies that were extra, because I didn’t take ALL THE TIME to plan what recipes I could make using all the exact same ingredients. Does this sound familiar to anyone else, or is it just me? So, after getting back from brainstorming with my parents about meals, I wrote down a rather large list of ingredients I wanted to have “on hand,” with the goal of doing my-dad-style cooking. And so far it is going great! The revolutionary part, for me, is that instead of making a few giant meals that we will get sick of, making meals that don’t do well leftover, and/or having leftover ingredients going to waste, I wash, chop, and prep frequently, leaving the prepped veggies/ingredients in the fridge so I can quickly whip up a meal. Rotating between a few different types of meals – stir-fry, soup, salad, wrap, smoothies – I can mix up the same ingredients, make meals quickly, and still have different-tasting food that I won’t get sick of. Genius! Why haven’t I ever done this before? It’s perfect for a family of two, like us. The other genius part? I write down a grocery list, and Whit does the shopping! Now, I don’t know if he’ll do the shopping for me every time, but there is a great incentive for him to do so, because when I make a list and he follows it, we don’t end up buying tons of extras that I fell for at the grocery store (I’m much more easily distracted than he is). Boom – efficient and money-saving! I’ve already written down one recipe, and I hope to continue sharing meal ideas as I come up with them. It’s much easier for me to eat healthier this way because I already have fresh ingredients, I just need to combine them quickly (which is fun! dumping pre-cut ingredients in a pan is my kind of cooking!) to come up with a new dish. So, if anyone else wants to try this “grocery planning” style of cooking, here’s the basic list of “staples” I came up with. I even broke it down into aisles/sections of the store. Definitely use this as a guide, altering to your specific tastes and preferences. Of course, you can buy fewer things at the beginning and add more later so things don’t go bad. My goal was for the fresh ingredients to last through two weeks and several different meals. One week down and so far so good. I think a lot of these things will last up to a month or maybe even longer, since I have so much variety to choose from. Some things like bell peppers and bananas may need to be consumed earlier, or just cut up and sauteed and placed in the fridge or frozen, depending on the veggie/fruit. I have needed to go back for more of certain items (tomatoes, onion, beans), and I have updated the list to reflect that. I also haven’t used certain things yet (lemon, mint, pineapple). In general, though, this is a good starting point. Note: In addition to the following, I have Arbonne protein powder as well as homemade granola (to use as a yogurt topping) from a mixture of toasted coconut, almonds, pecans, sunflower seeds, dried cranberries, and chia seeds (I bought all of those at Trader Joe’s for about $25, and will make 3+ servings of Coco Nutty Granola). Whatever is on sale of the following: (buy 2-4 lbs of whatever is cheapest or mix and match if pricing is similar) – look for free-range or grass fed please! All of this cost around $150 in Blacksburg, VA, which is not too bad, especially considering how many meals I’ve already gotten out of these things. 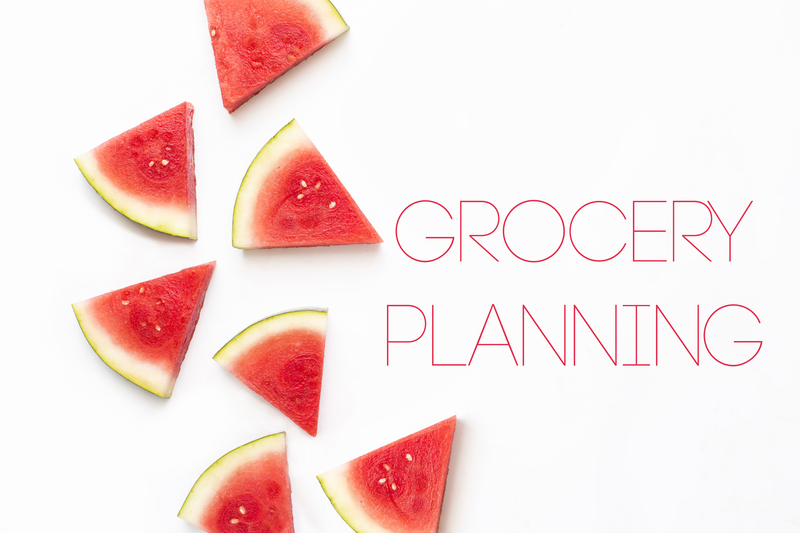 Do you already plan your meals and shopping like this? I’d love to know what works for you! This is a great way to do it! I’ve started (trying) to do the same (though I was better about it when we were in CA). But I’ll think up recipes that have a bunch of the same ingredients that I can prepare veggies and such for for a couple of days in advance; use half an onion in this stir fry on Monday night and then on Tuesday throw the other half in the crock pop for a stew. It has done a good job of cutting down on waste and keeps us eating relatively healthy meals (by preventing total laziness).